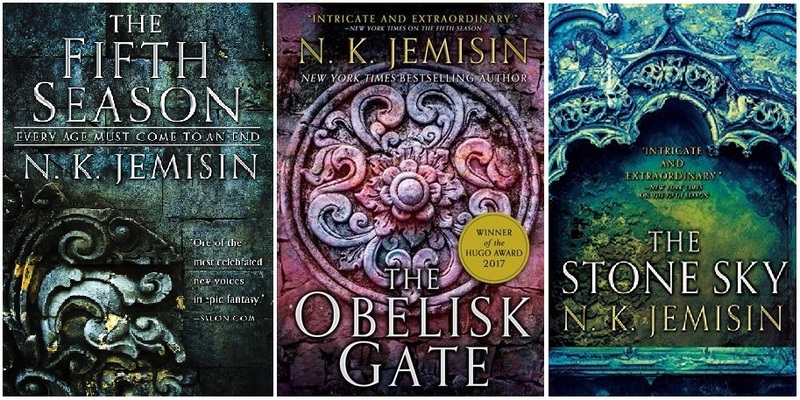 Some thoughts about this multi-Hugo-award-winning trilogy. The parts I liked, and the parts that mean I'm going to end up complaining anyway. I'll mark the point where the spoilers kick in. The series takes place on a dystopian far-future Earth where geology has gone horribly awry, leading to a pattern of disastrous "Seasons." Communities that still exist have developed long-term survival techniques like "maintain store-caches with a decade's worth of food at all times." A subset of humans are born with the ability to sense and control earthquakes by redistributing energy. You would think this would be a great and useful skill that communities compete to attract, but nope, they're hated and feared so much that discovery of the skill can prompt people to murder their own children. There's an isolated training center that trains and controls them, and residents of that center are hired and tolerated -- just barely. One cool layer in the worldbuilding is how much disparate strands of culture are influenced by the worldbuilding. There's no sense of religion, other than an anthropomorphization of the Earth itself as a malevolent force. All their swearwords are derived from rocks/dirt/geological events. Organized study of astronomy is gone, because everyone's survival depends on looking down to such a degree that nobody has time to look up. There are a couple of hints dropped in the first book, like how the legends say the Earth "hates humanity because humans killed his favorite child." The characters don't say anything more directly, because they don't know what they don't know, but the readers can put together once this means. And it ends with a great Wham Line, even if you knew it was coming. The wise old mentor who's been talking to even-wiser old immortals says to our main character, "Have you ever heard of a 'moon'?" ...which calmly reveal that, actually, humans' earthquake-controlling power had already developed when the moon was still in place, and don't even bother with handwavey scientific explanations because it's just magic, we're all gonna start calling it magic now, and also? The Earth literally IS an evil conscious entity that is actively trying to kill humans. Sometimes with its mind-control powers. Oh, and there are some surviving ancient cities that still have their high-tech machinery in perfect working order. Twelve thousand years of regular catastrophic continent-destroying disasters, and the monorail isn't even rusted. Don't get me wrong, the writing is still good, and the series is enjoyable through the end -- as long as you have a high tolerance for "unrelenting terrible things happen to everyone and then they die." But what was the deal with that untwist? It set up such a good, meaty, subtly-revealed, realistically-integrated backstory, and then dropped the whole thing for "never mind, everything was magic the whole time." I don't think we got a better story out of this direction, either. "Characters racing to understand the laws of nature quickly enough that they'll be in a position to fix a millennia-long human-caused climate disaster" is much less common, premise-wise, than "characters fighting against an evil magic Final Boss." They did get the moon back, at the end. (Approximately 2 people from the entire cast were still alive to see it, even!) But since the Earth was literally conscious and evil, this just makes it hate humans somewhat less. ...was the Moon also conscious? Will it be able to convince the Earth to chill out? That interaction could've been a powerful payoff, would've made me feel somewhat better about the premise, but we didn't get it. Didn't get anything that made me think the untwist was worth it. "Characters racing to understand the laws of nature quickly enough that they'll be in a position to fix a millennia-long human-caused climate disaster"
I would read that so hard! Despite the untwist, would you recommend the books? Yes, but not universally! The biggest catch isn't the untwist, it's the "unrelenting terrible things happen to everyone and then they die" factor. For people who can't enjoy a story where that's happening, I don't recommend forcing yourself through this one anyway. AN excellent point, thank you.